How many Bowl games does D2 Football have. What are they called and are they all tied to a specific conference. Seeing how my Mo S&T Miners are going to finish a great season and not get a playoff invite I was wondering if maybe a Bowl game would be a possibility? Also, how long after the regular season finishes until the Bowl game is played? Someone covered the detail in the MIAA forum. THere are 4 bowl games and they have normally been played 3 weeks into the post season. 3 extra weeks of practice for next season being the biggest benefit to tgetting a bowl invite. 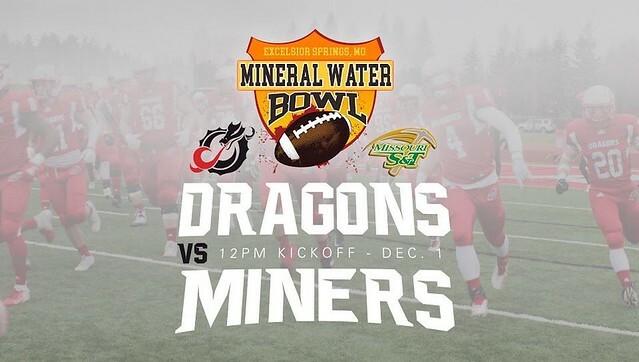 The Mineral Water Bowl is the first Saturday in Dec. One of the schools is out of the NSIC and the other one they choose. Missouri S&T makes sense for the MWB. Best of luck to the Miners. Make some special team big plays and yards after catches and don't give them up. Witt, great job as usual. Go Dragons! I'm doing good in the playoffs....bowl games are a crapshoot my friend. U told your wife yet that you will be devoting Wed nights to researching teams and putting that into a weekly column yet..? I have been on the bandwagon all year long. This was a very good team that deserved to be in the playoffs! I honestly believe this years team could play with just about any D2 team(not saying they would beat all teams but I think they would be very competitive with even the upper crust team in D2). The playoff selection format must be looked at if you really want to be totally unbiased. Ok, rant over. Great job by everyone involved with this years team. We lose some real good Senior players but also return some real good young players also.